Whilst the Commonwealth War Graves Commission provides memorials to people killed in war, many who have been lost at sea - whether during peacetime or in war - have had no such memorial. The Memorial Book for those lost at sea was established by the Maritime Foundation to provide just such an enduring memorial. It records the names and circumstances of the deaths of people lost at sea with no known grave. To see a list of the current entries, please click on the image of the Memorial Book to download a copy. Entry is open to all who have been lost from ships, inshore craft, offshore installations and from beaches and who have no known grave. A small charge is levied to cover the costs of inserting entries into the Memorial Book. If you have a relative or friend whom you would like commemorated in the book, you can download an application form here. A Service of Thanksgiving is held in October each year for friends and families to commemorate those whose names have been entered in the Memorial Book. Next year's service will be on Thursday 10 October at Noon. On Sunday 30 April 1950 a memorial service was held in St Martin-in-the-Fields to commemorate the achievements of the Reconnaissance Corps during the 1939-45 war and those of the officers and men who fell in the service of their country. During the service a table inlaid with the Corps badge on the top, and beneath it a book of Remembrance containing the Corps Roll of Honour, were dedicated by the Chaplain-General to the Forces, The Rev'd Canon LL Hughes. Later the entire Table and Book of Remembrance were entrusted to the care of the Rev'd Tubby Clayton to remain permanently in the Baptistry of All Hallows. 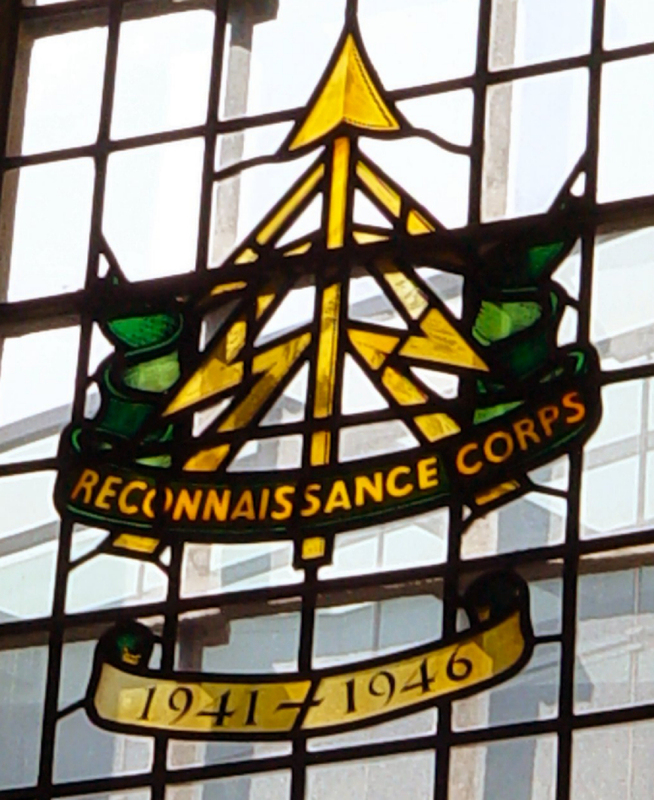 On Remembrance Sunday, 10 November 1985, a stained glass window bearing the badge of the Reconnaissance Corps was dedicated. The memorial window commemorates all who wore the badge with pride. It not only symbolises the formation of the elite, where only the highest standards were acceptable and where considerable bravery was exhibited in leading from the front, but a sense of comradeship born out of mutual dependence and strength of faith in each other. If you wish to contact those who have information about the Corps, please contact Pat Mellis (Secretary, Reconnaissance Corps Association) email: pat4reccecorp@yahoo.co.uk.